Shayfer James’ relationship with a piano can be traced back to early childhood. After nearly losing two fingers reaching into his father’s tractor, emergency surgery and skin grafting, James’ mother showed him how to exercise his fingers using a piano. It is his relationship with pianos that, fifteen years later, resulted in it becoming an innate emotional and physical extension of his songwriting. James has been recording music since 2008, and his latest release, Hope and A Hand Grenade, shares stories that are both lyrically haunting and melodically breathtaking. The six-track EP is a satisfying mix of slower and faster tempos that keep the listener curious. The first track, “Mercy Down”, immediately pulls the listener in while “Crack a Bottle, Run a Bath” brings thunderous guitars to the EP’s close. It’s hard to choose a stand-out track as they all bring out the best in James’ vocals and songwriting ability. With slower tracks like “Ophelia” and “Mostly Major Chords”, it’s easy to get lost in the lyrics. “Boots Worn Through” and “Day of Reckoning” are both eerie and piercing to the point that they must be repeated a few times to catch all the pieces that bring the songs together. Since spending more than a decade creating music, James’ creation process has been a lot of trial and error. While he is always learning something new, he knows exactly what to bring to the table when it’s time to record. James has also learned to be patient and respect the craft of engineers while in the studio. He’s learned to listen and be open to any idea. He’s learned to try everything at least once. Jokingly, he’s learned at the third take is almost always the keeper. 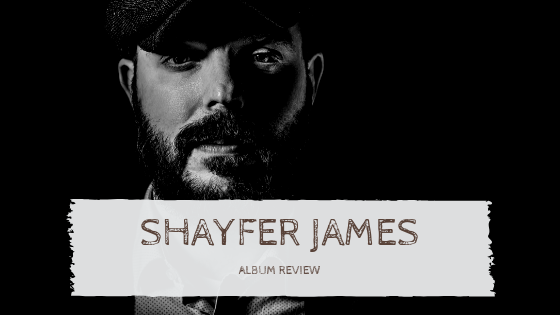 Shayfer James’ relationship with a piano has gone from childhood to adulthood, and it sounds like he wouldn’t have it any other way.